81 Wellesley St E, Toronto. 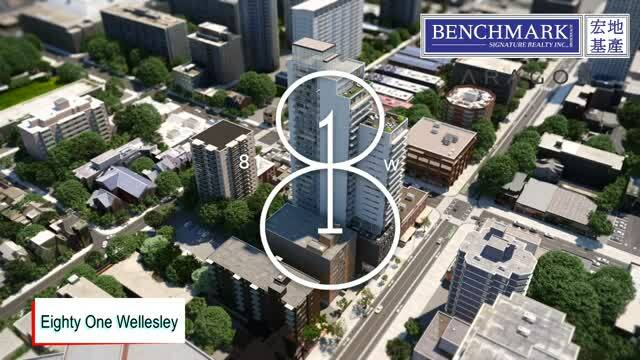 Eighty One Wellesley Condos is a brand new development planned by Aragon. From inception 25 years ago, Aragon has focused on innovative and distinctive design combined with outstanding quality. Honouring these values expresses their desire and commitment to creating sophisticated homes. The tower will rise from a six-storey, 20.7-metre-high podium structure, which will be clad in a dark brick. On the podium's north facade which fronts onto Wellesley, the brickwork will take the form of a lattice-like screen with balconies contained within. Both the height and cladding choice for the podium were carefully selected to create a relationship with the older masonry structures in the area, in particular the 1960s-era modernist apartment buildings found throughout the surrounding neighbourhood. The building's base will also offer some major improvements to the existing public realm, with the addition of a forecourt stretching 7.5 metres south from the property line, and sheltered by a third-level overhang that will provide some weather protection for the space. The forecourt will feature finishes such as granite paving slabs, Ipe wood benches, an Ipe wood soffit overhang underside, and an illuminated water feature. The podium levels will be visually separated from the tower floor plates above by a two-storey glazed "spacer" floor occupying the 7th and 8th levels. While creating a visual distinction between the podium and tower floors, this part of the building will be home to the bulk of the residential amenity areas, both inside and out, while a separate lounge space will exist on the ground floor. Above the double-height amenity level, levels 9 through 22 of the tower portion will be set back 5.5 metres from the east property line and 3.05 metres from the west property line. A large notch will exist on the west face of the tower to bring more light into the residential units, while a solid precast vertical section where the elevator core and stairwells will be located has been placed midway along the eastern property line. Above the 22nd floor, the form steps back to the north at level 27 and once again at the mechanical penthouse level—the impact of which will be minimized by additional 5.5 metre setbacks from the east and west property lines. THINK BIG. HOMES DESIGNED FOR REAL PEOPLE. Interiors at Eighty One Wellesley are thoughtfully designed to encourage stylish and efficient living. The minimal aesthetic exhibits distinctive character with beautiful engineered hardwood flooring and large windows that invite plenty of light inside. The state-of- the-art, full-size European appliances speak to your culinary desires, and balconies or terraces include barbeque hook-ups for summer entertaining. Beyond your private residence, the variety of indoor amenities and outdoor public spaces are designed to bring people together – another cue from the social neighbourhood. Church-Wellesley Village is one of Toronto’s most vibrant historical neighbourhoods. Real. Authentic. Diverse. Source original items in unique boutiques. Dine on food made from the soul at a selection of restaurants. Find an array of services to fulfill all your needs. Everything is within a three block radius. Live in a central locale, where you can easily touch the whole city of Toronto by street or rail. Access a metropolis while possessing high quality of life in an intimate neighbourhood.